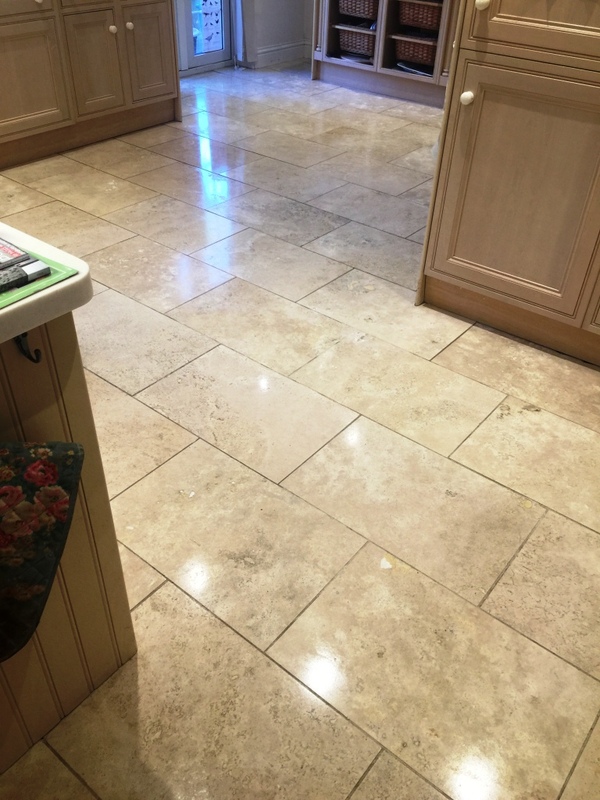 This customer, who lives in East Byfleet had been experiencing difficulties in keeping her fantastic Travertine tiled kitchen floor in good condition. 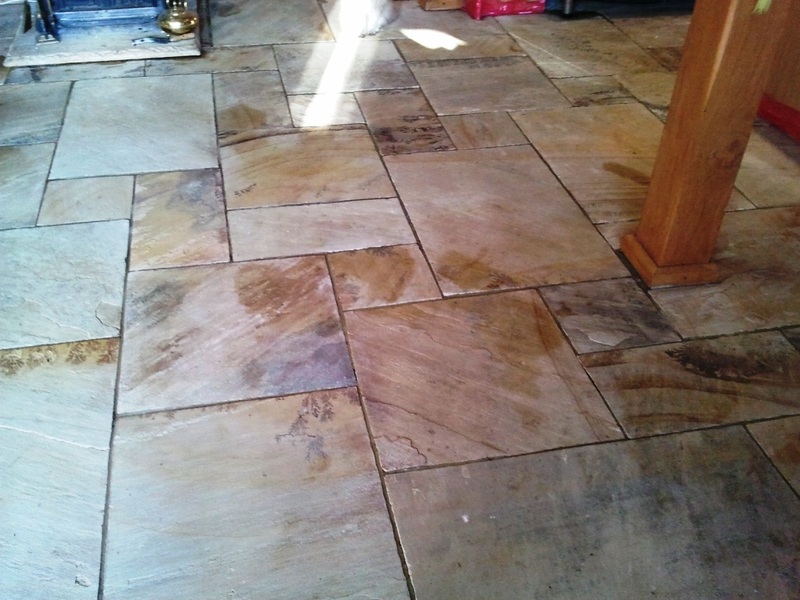 Over the years it had suffered from a heavy build up of dirt and oily stains, not to mentioned a number of cracks and small holes. 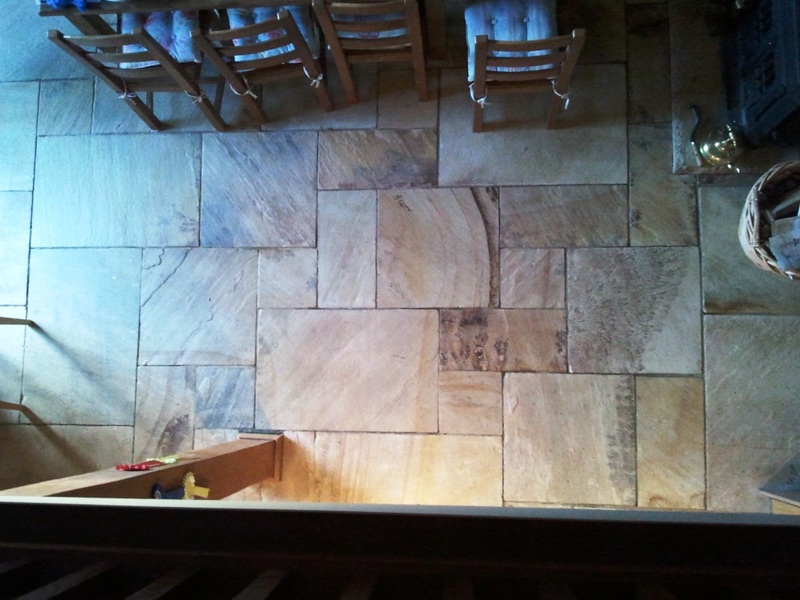 Needless to say, the customer was keen to restore the Travertine tiles to their former glory. 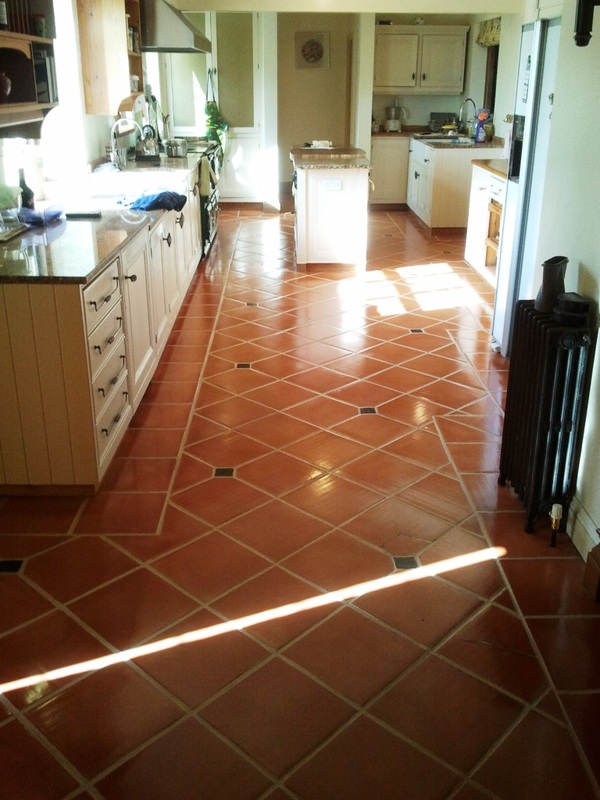 To begin the restoration, I applied Tile Doctor Remove and Go across the entirety of the large tiled area. 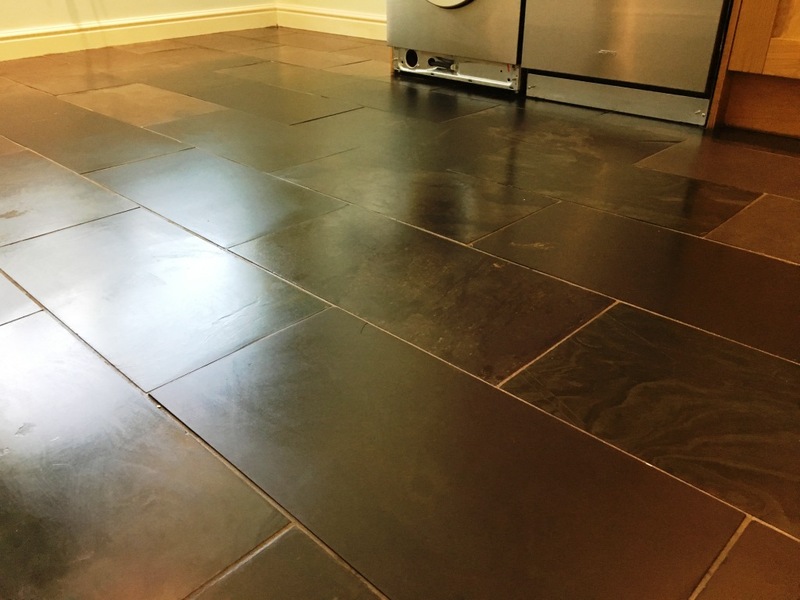 This heavy duty remover breaks down any old sealers and other coatings, leaving the area ready to cleaned or, in this case, burnished. 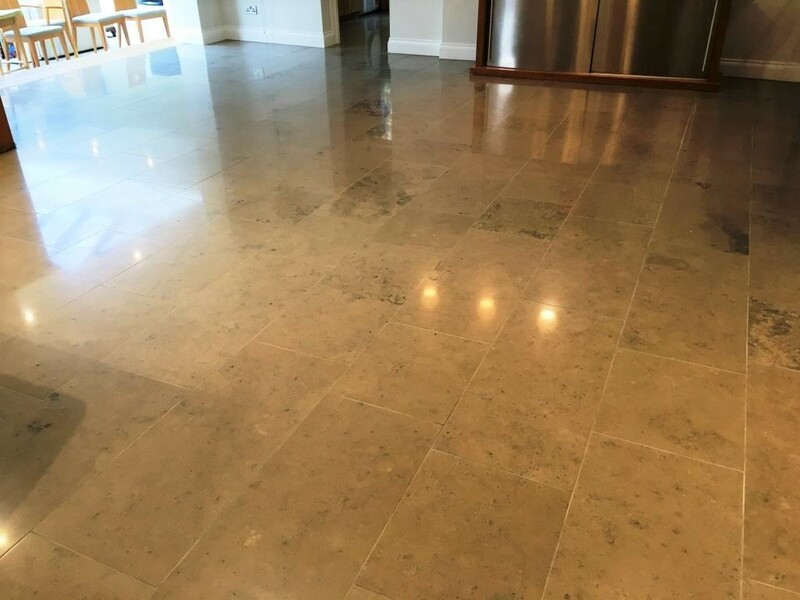 Burnishing is a method for cleaning and polishing certain types of high-end stone, including Travertine, Marble, and Limestone. Our burnishing system involves the application of four diamond encrusted pads of varying grits. 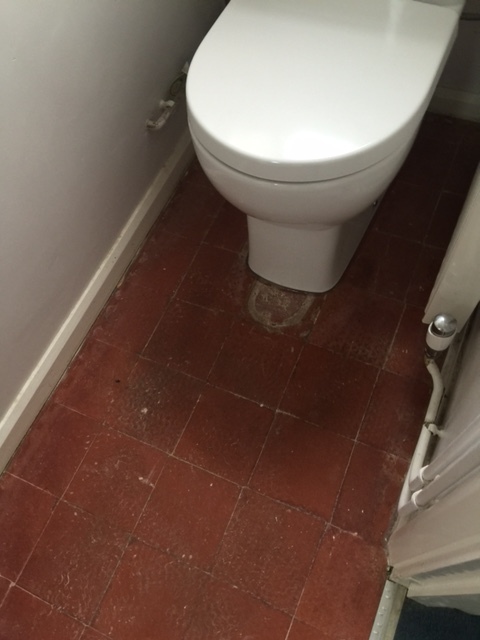 Firstly, I applied the Coarse grit pad, which helps to break down any dirt and stains on the surface of the tiles. 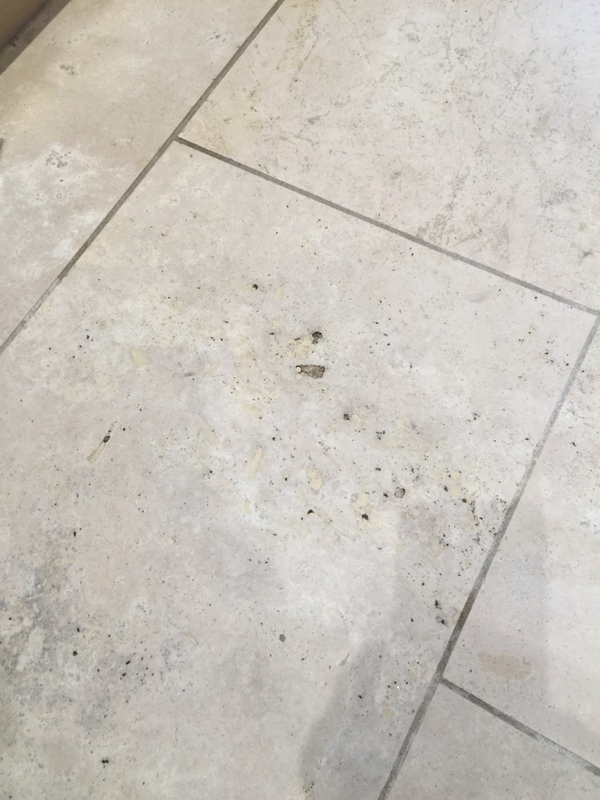 Then, I worked my way through the Medium, Fine, and Very Fine pads, using a little water as lubricant, to gradually refine the polish on the Travertine. It was then rinsed and left to dry. 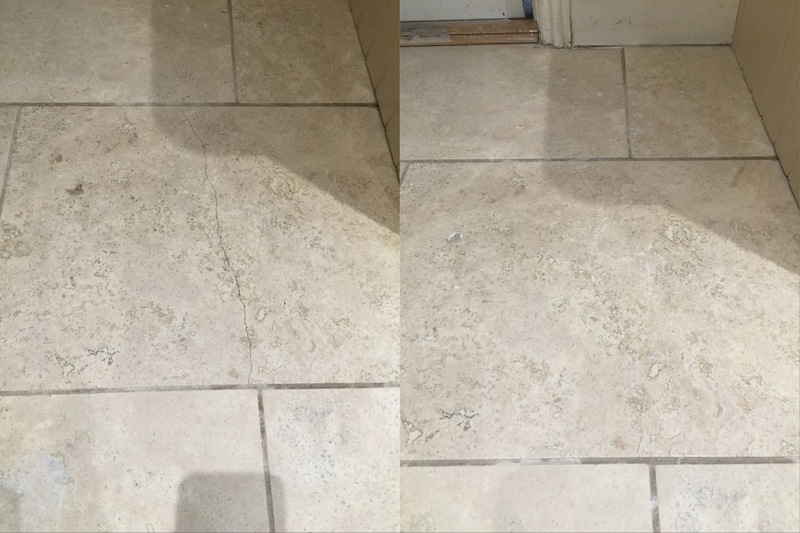 To round off the first day of work, I filled any cracks and holes using our two-part resin system which greatly improved the look of the tile. 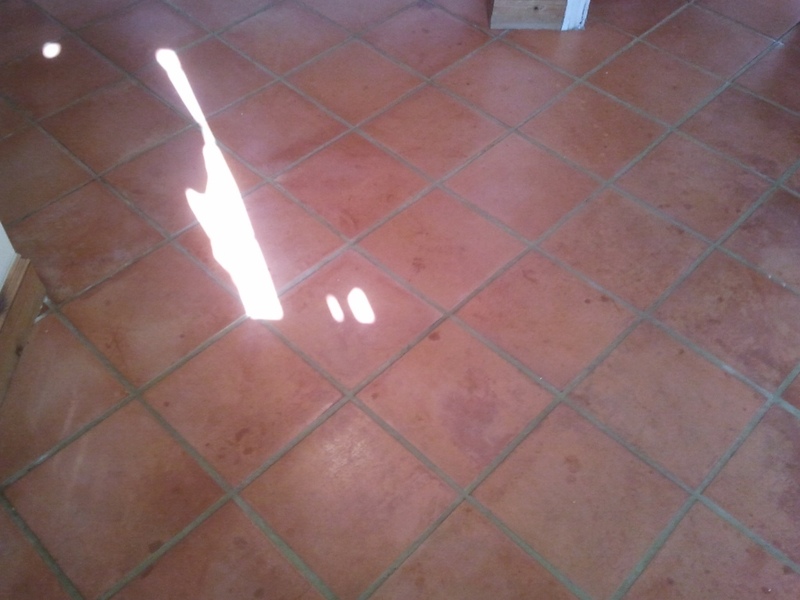 The following day I returned to the property to seal the tiles checking first that the floor had dried. 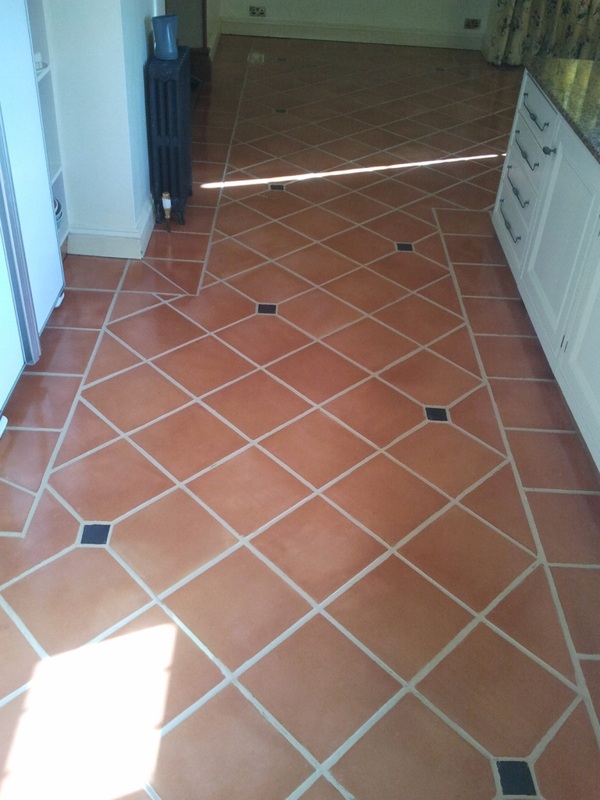 All was well so I proceeded to seal the floor using our colour intensifying impregnating sealer Tile Doctor Colour Grow. 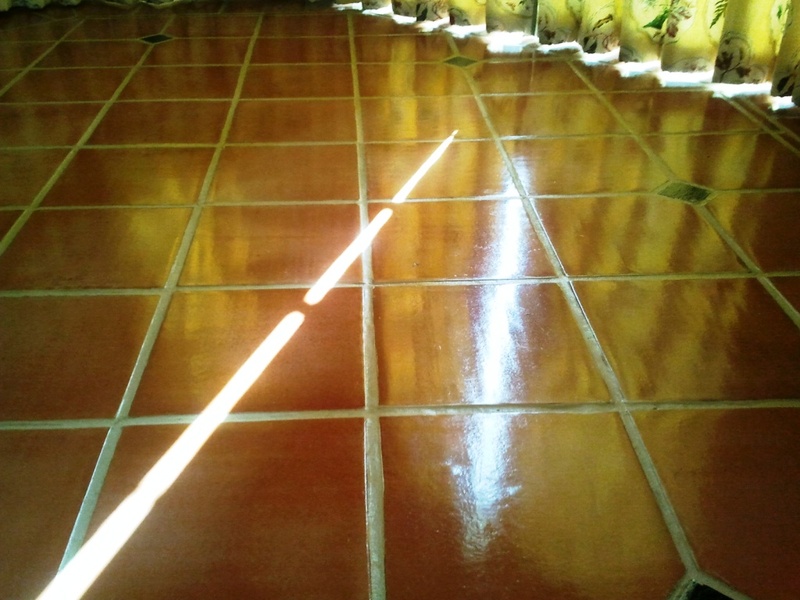 Once that was dry, I added the finishing touches by buffing the floor with a soft white buffing pad. 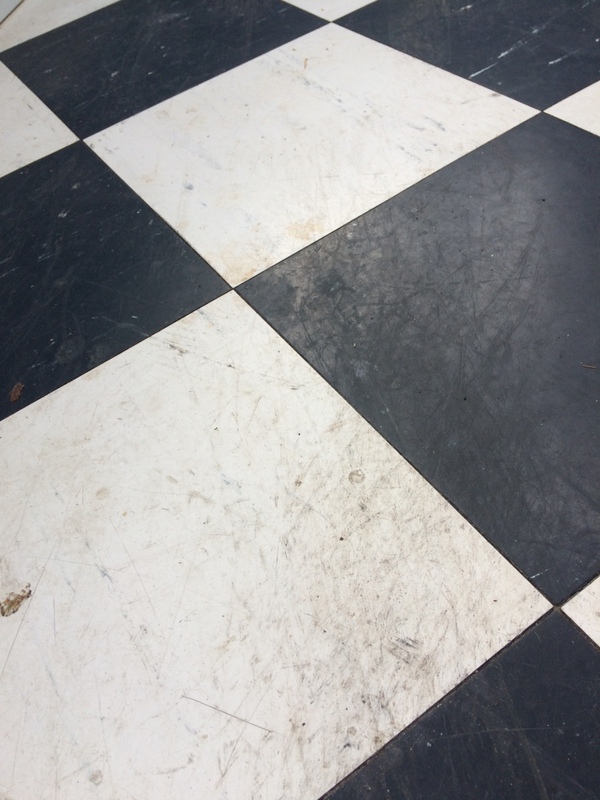 As you can see from the photographs, the combination of a fresh seal and polish worked wonders. 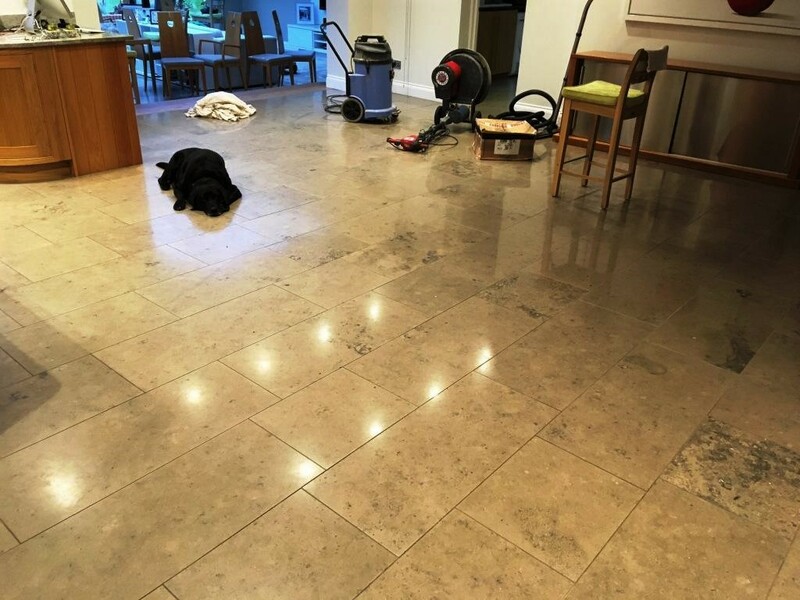 To clean the floor we used a solution of Tile Doctor Pro-Clean which is a flexible strong alkaline cleaner specially designed for use on stone floors mixed 50/50 with Tile Doctor Nanotech Ultra-Clean which contains tiny abrasive particles. 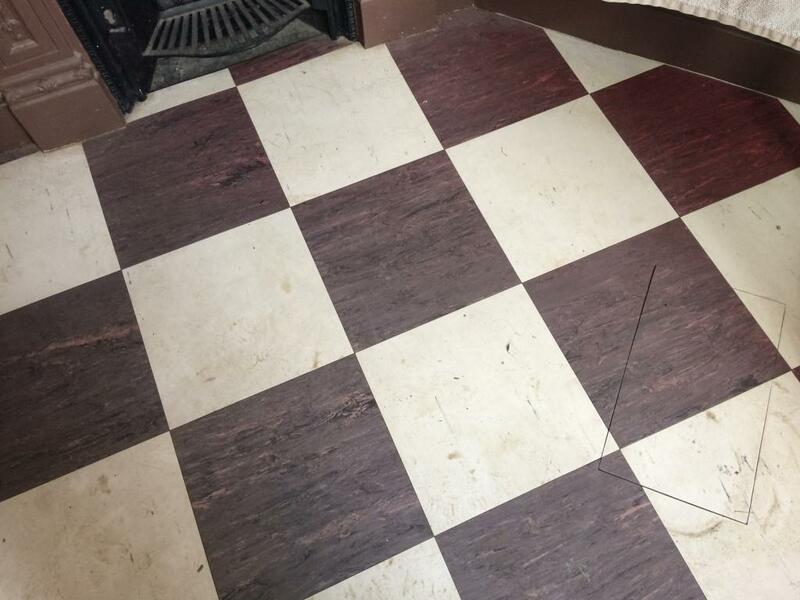 This solution was left to dwell on the floor for thirty minutes before being worked into the floor with scrubbing brushes. 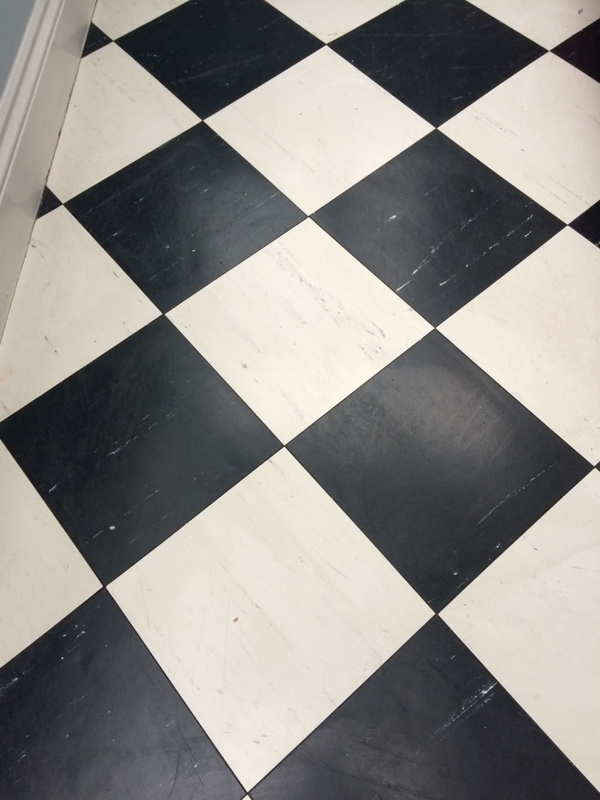 We then used a tile spinner tool and truck mount cleaning system to rinse the floor of all residue soils and chemicals, the floor was covered with dust sheets whilst it dried and also to keep it clean until we came back to seal it. 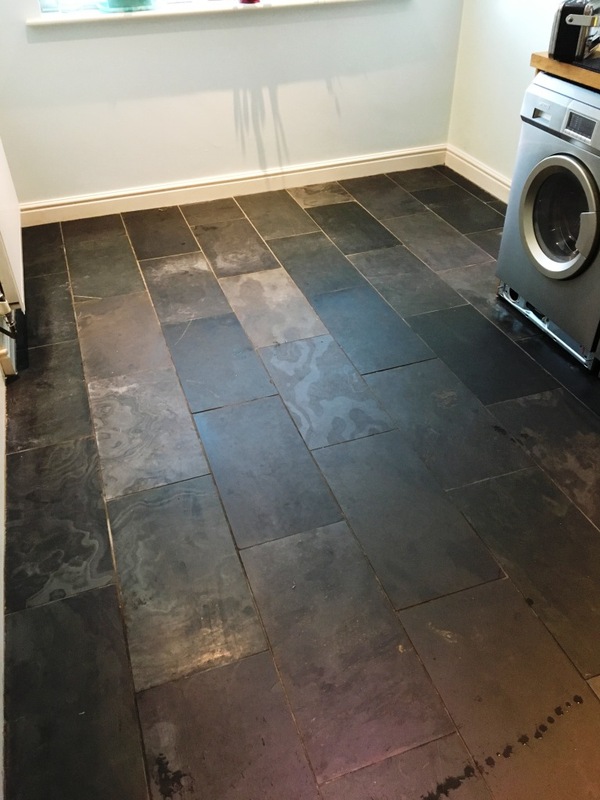 On our return we discussed the effects of different sealers, they all offer stain protection to different levels but change the appearance of the tile in different ways. 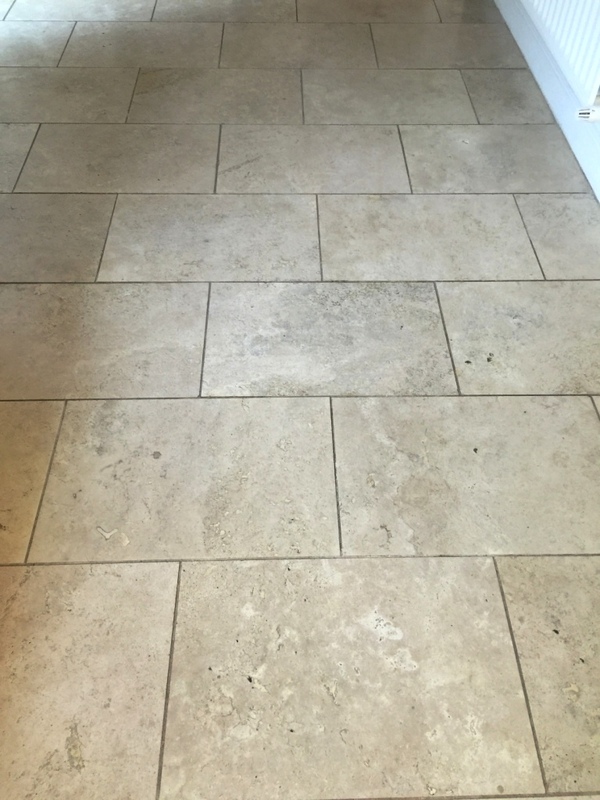 The customer liked the natural look of the stone so we applied Tile Doctor Ultra-Seal using three coats of sealer to fully seal the tiled floor; Ultra-Seal is also a penetrating sealer that gets deep into the pores of the stone. 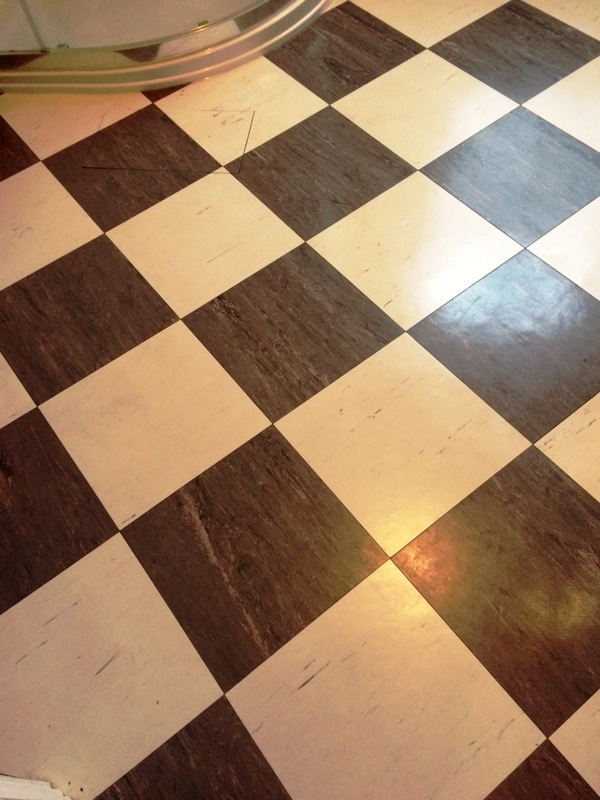 The customer was delighted with the result and we have been asked to return every year to maintain the floor. 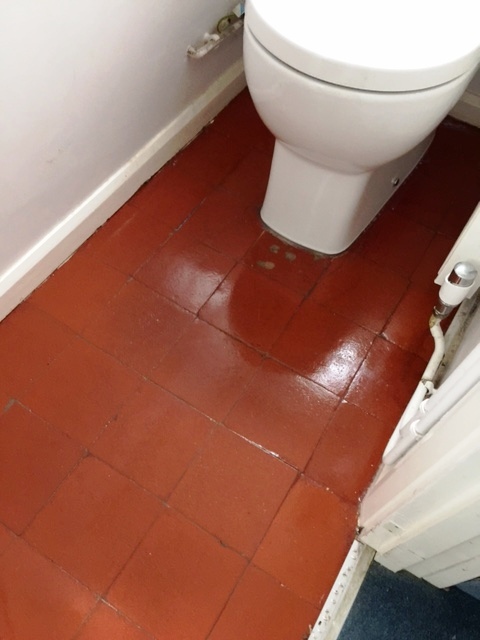 This customer had a terracotta tiled floor in the kitchen, utility room and toilet, which hadn’t been sealed for 8 years and was was in needed of restoration. 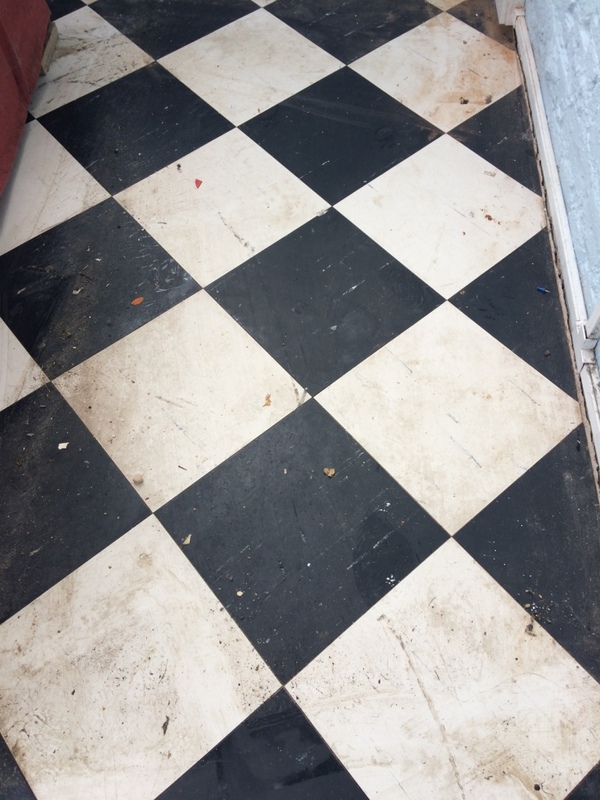 On full inspection we also found that there was loose and missing grout some of which was in different colours. 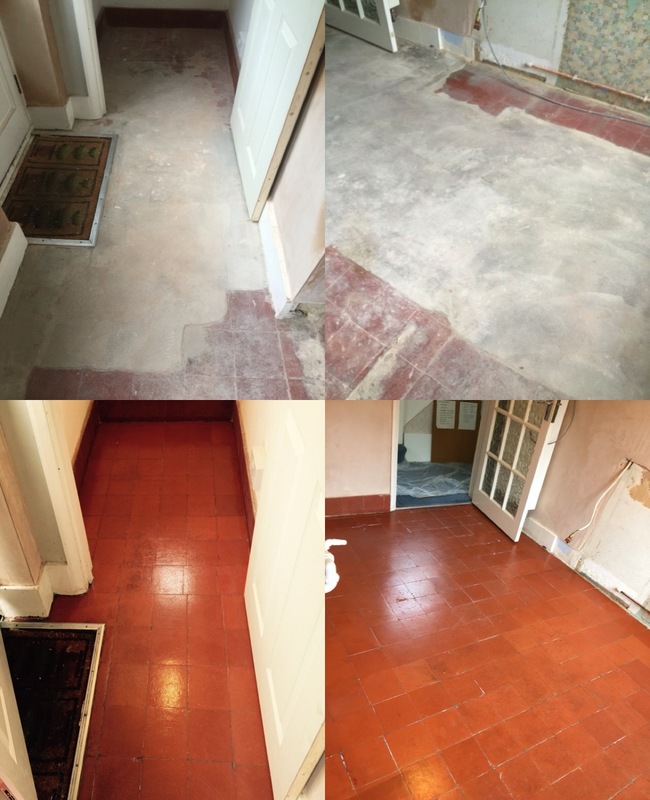 We started the cleaning process by giving the terracotta floor a deep clean by using Tile Doctor Pro-clean agitated with scrubbing with deck brushes to remove soil build-up and old sealer residue. 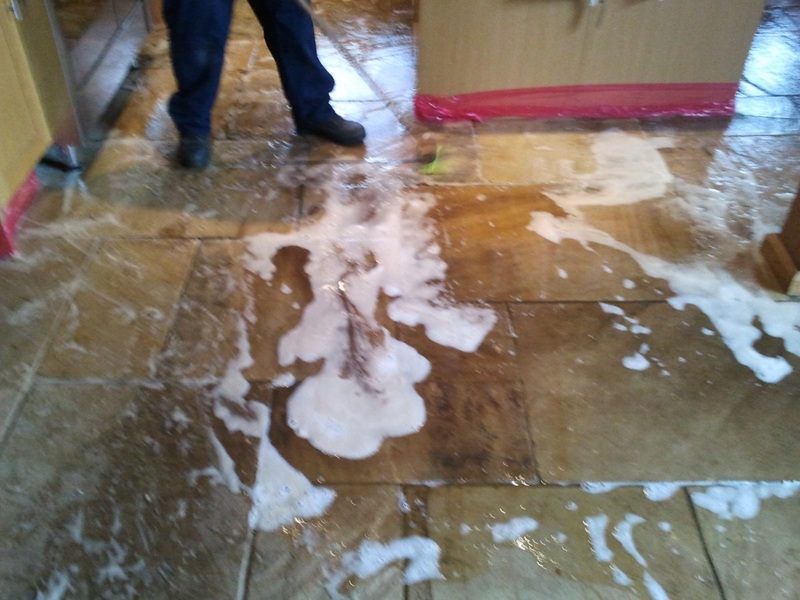 We then thoroughly rinsed the floor using our truck mounted machine and spinner tool. 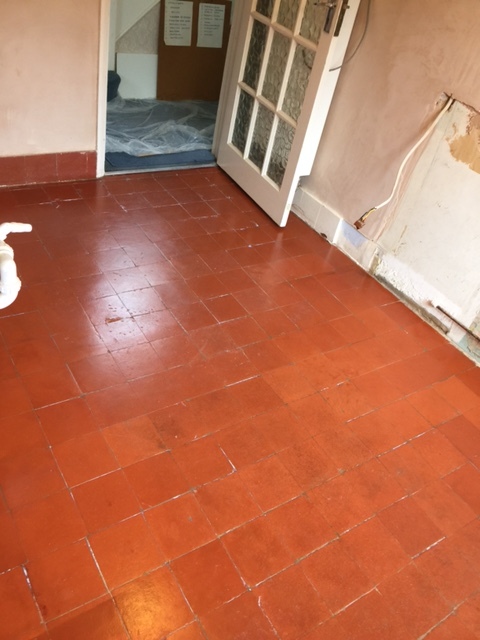 Cleaning Terracotta Floors can be difficult and we experienced difficulty removing the oil stains from the tile as terracotta is very porous and had absorbed the oil like a sponge. 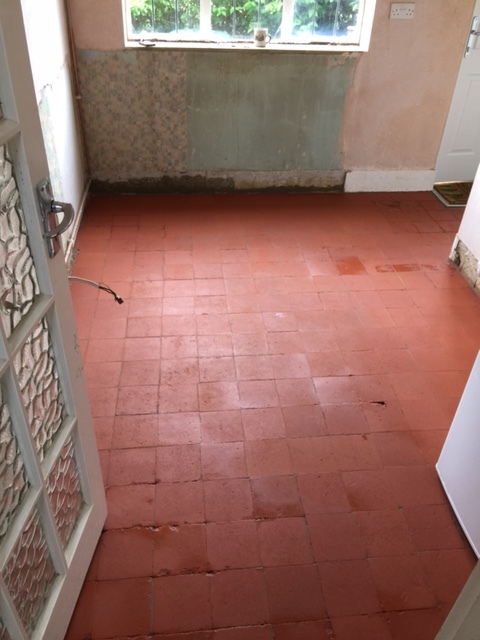 We then applied Tile Doctor Remove and Go to the stained areas then sprayed with a light spray of water to help keep it moist and stop it drying out, we left this solution on the tiles for 90 minutes. 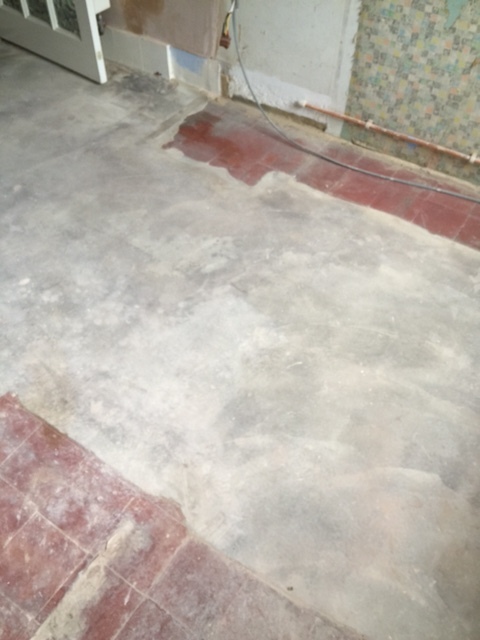 After the dwelling time we steamed the floor as we rinsed off the Remove and Go. 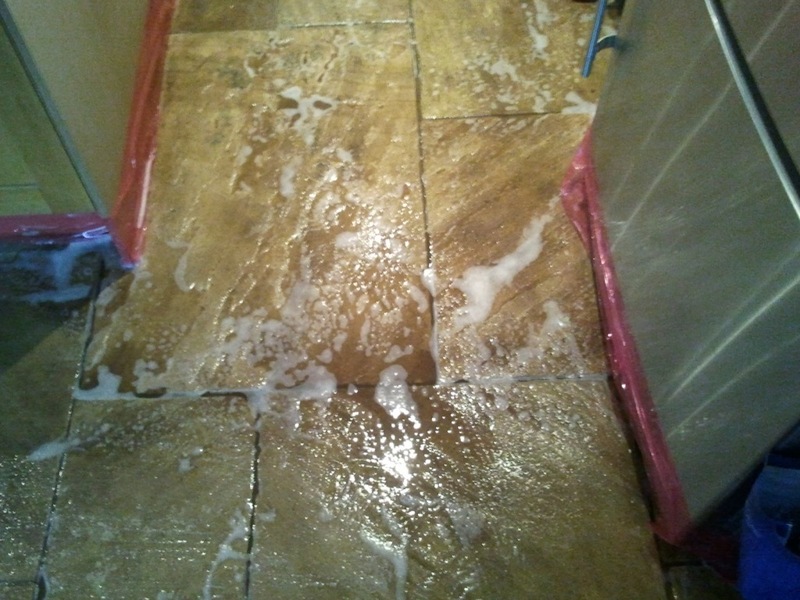 The next step was to rinse the complete floor with our truck mount cleaning system and a tile cleaning spinner tool. 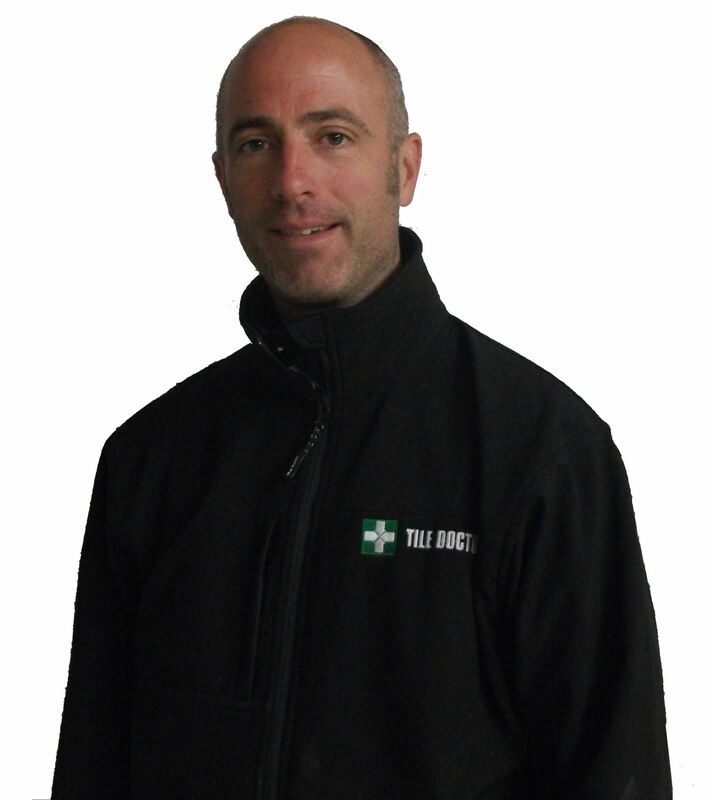 This thoroughly rinses and thoroughly cleans the floor with very hot water and high pressure. 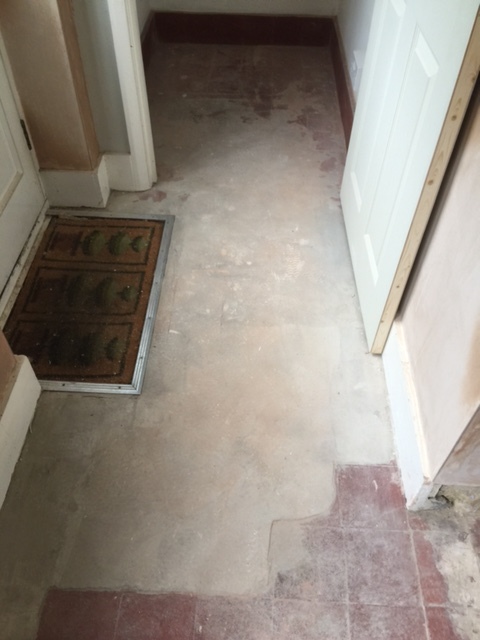 Next we had to then tackle the grout problem, so we removed all loose and old grout, where needed and re-grouted the floor. This was left to for 48 hours to completely dry. 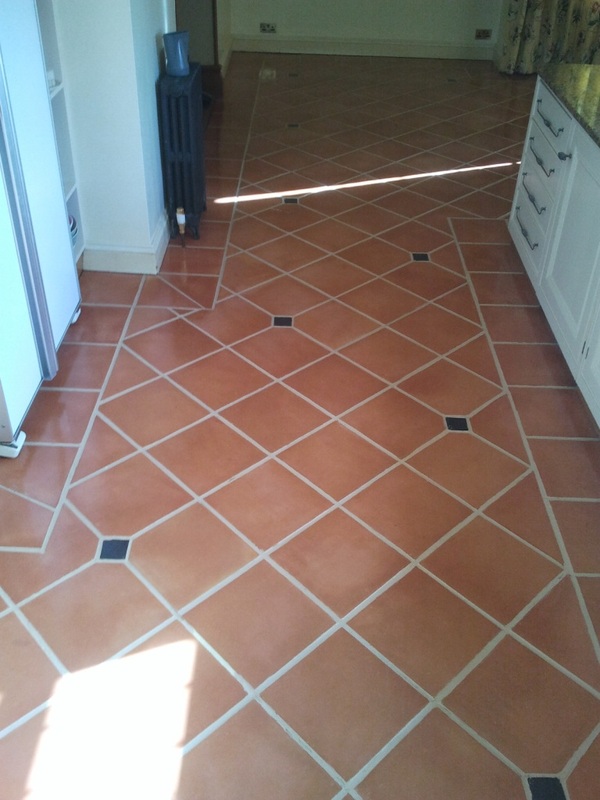 Terracotta is very porous and for this floor we applied 8 coats of Tile Doctor Seal and Go, leaving it to dry for 40 minutes between each coat. 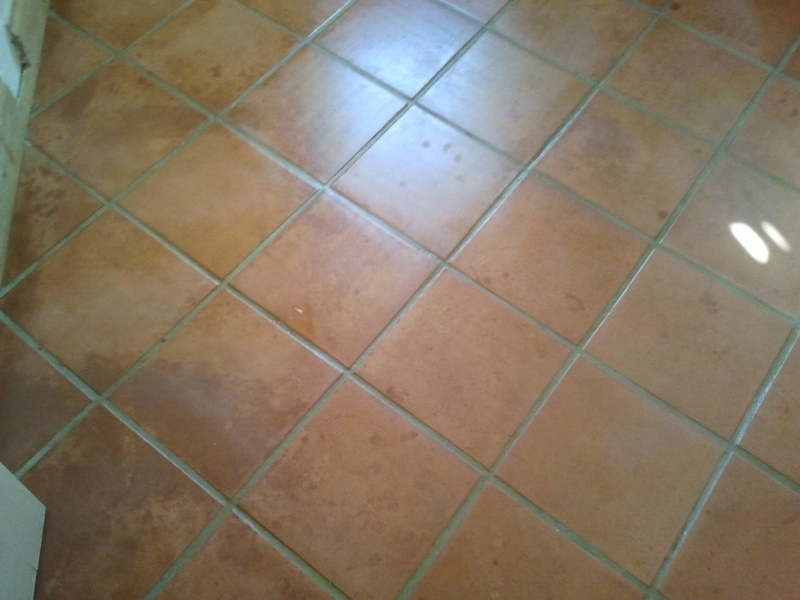 We returned the following day and re-coloured the grout with Tile Doctor beige grout re-colourant. This was then left to dry and a further 3 coats of Seal and Go applied.